Ladies, we're relatively new to this whole wedding game. Heterosexual couples have a pretty well-established model in place when it comes to their weddings. I've been to several beautiful and unique straight weddings, but many follow a fairly predictable pattern. As lesbian brides, we have an amazing opportunity to define what marriage means to us and create our own customs. I'm not saying we need to reinvent the whole wheel, just tweak the process a little to make it our own. 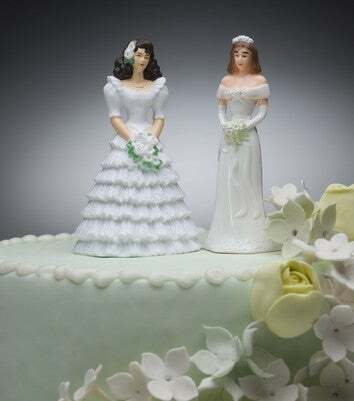 There are some things I really like about hetero unions that I think we should hang on to – decadent tiered cakes covered in fondant and week-long honeymoons on exotic beaches, to name a couple. But, there are some other traditions I think we need to ditch. Let she who has never stood awkwardly on a dance floor with a few other single gals waiting to catch some tacky flower arrangement, while a room full of married couples looked on with pity, toss the first bouquet. Come on, girls! This is just mean and almost primitive if you ask me. Is it not enough that all of your single friends have shown up to celebrate the fact that you've found true love – and maybe even cut you a check to prove how happy they are for you? Do you really need to highlight the fact that they are still single by ostracizing them at your wedding? It's hard enough to be single at a wedding – spring for an open bar so your pals can have a good time, and keep your bouquet to yourself. No one wants to show up at a party wearing the same outfit as anyone else – this is a well-known fact. So, why do millions of women every year insist on dressing their bridesmaids in the same damn dress? If I'm going to be your "maid" for the day, please grant me the small dignity of not having to wear a uniform! As gay ladies, I expect us to be a lot more creative in the wedding party department. I imagine plenty of lesbian brides will have both men and women in their wedding parties, and some will do away with the custom completely. If you do want to choose some close friends or relatives to stand up in your wedding, consider letting them pick out their own clothes for the occasion. Is there no way other than the Electric Slide or the Chicken Dance to liven up a party these days? Dancing at weddings is fun, and some people can be reluctant to show off their moves – I know this. But, I have a firmly-held belief that we can lure our loved ones onto the dance floor without playing "Boot Scootin' Boogie" or "Do the Hustle." Some other possible incentives for your guests to dance could be, um, good music that people actually enjoy listening to and the above-mentioned open bar. Heterosexual marriage has some decidedly unromantic beginnings. Unions were formed primarily to transfer wealth, women needed a dowry to land a man, and husbands essentially "owned" their wives (gag). I don't know about you, but none of that stuff makes me want to prance down the aisle. Obviously, modern heterosexual marriage has evolved past its creepy origins. But, sadly, when straight people get married, they are, for better or worse, participating in a custom that has a fairly questionable history. If I were heterosexual, marriage would be less appealing to me because I'd have a hard time separating it from its sexist history - and I've talked to plenty straight women, and men for that matter, who have grappled with the issue. But, since gay folks have never been a part of "traditional marriage," our unions are automatically free from any negative historical associations! We're starting from scratch, so we get to form equal partnerships that are based on love alone (or possibly on neediness, desperation or co-dependence, but that's another column). We get to have the emotional benefits of lifelong unions without all that historical baggage. How great is that? I'd even bet good money that in a couple of decades, straight couples are going to wish they could get "gay married" instead because it will have become synonymous with an equal and loving partnership that has no assigned gender roles or sordid back story. I'm not even engaged, and I already have my long-sleeved ivory winter wedding gown designed in my head. And I'd like my partner to be dressed in sleek, tailored black suit. But, I also wear aprons when I cook – I'm a traditionalist in that sense. I don't see any need for gay girls to adhere to the black and white dress code that is very obviously lifted right from the hetero wedding playbook. If you want to tie the knot in a purple vintage dress or your snazziest Chuck Taylors, I say go for it. If you're a butch woman who suddenly wants to wear a dress for your nuptials, you should. If you and your sweetie envision yourselves in complimentary pantsuits, those are what you should wear. We're not bound to any conventional wedding day dress codes, so I think we should get married in whatever makes us feel happy and fabulous – even if that is a big puffy white dress or a traditional black tuxedo. At the end of the day, your wedding should be reflection of who you and your future wife are as a couple and it should include elements that are special to you. So, if you've always dreamed of tossing a bouquet over your shoulder to a line of bridesmaids in matching pink dresses dancing in lockstep to The Macarena, I won't judge you (too much). This post originally appeared on AfterEllen.com. Republished with permission.